Below you can view all the homes for sale in the Aurora At Cross Creek subdivision located in Aurora Colorado. Listings in Aurora At Cross Creek are updated daily from data we receive from the Denver multiple listing service. To learn more about any of these homes or to receive custom notifications when a new property is listed for sale in Aurora At Cross Creek, give us a call at 720-580-6694. The finished basement is perfect for entertaining with a wet bar and mini refrigerator and plenty of room for storage and another 3/4 bathroom. Call for your private showing! MLS#4456065. COLDWELL BANKER RESIDENTIAL 24. Near Buckley air Force Base and the Denver International Airport New Shopping Center being built within walking distance 1 year Home Warranty provided MLS#1941738. eXp Realty, LLC. The home also had a hail-proof roof installed in 2013. Don't miss out. 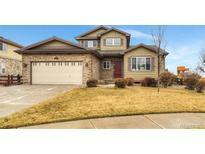 MLS#6765067. Home Bay Broker CO, Inc.
Don't miss your opportunity to own a wonderful home at a great price!! ! MLS#4857994. Keller Williams Preferred Realty. Outstanding Clean condo * spacious 2 bedroom 2 bath with vaulted ceilings * corner unit * close to E-470 & I-70 * Features Laminate Hardwood floors * Refrigerator included * Microwave oven * 1 car detached garage w/garage door opener * beautiful clubhouse and stunning Pool * Gas Fireplace * open floor plan* eating space in kitchen * plenty of kitchen cabinets...... 15 Minutes from DIA!!!! show this one!! ! MLS#2799723. A House-Sold Name. pool access additional 18 per month. MLS#7880607. ASSIST 2 SELL PIELE REALTY. Bright, open and well maintained 2 story home in the Cross Creek Subdivision ~ Across the street from one of the neighborhood parks ~ Close to neighborhood schools ~ 20 Min to DIA ~ 12 Min to the new Gaylord Rockies Resort & Convention Center ~ Large open kitchen and family room ~ NEW Luxury Plank Vinyl Flooring throughout the main floor and upstairs bathrooms ~ NEW carpet in remainder of home ~ NEW Paint inside and out ~ Eat in Kitchen with mountain views of Pikes Peak from the patio doors ~ 2 Pantry closets ~ Gas Fireplace ~ Newer kitchen appliances included ~ Newer hot water heater ~ Cross Creek Metro District No 2 includes Pool/Clubhouse/Common amenities/Trash service ~ Check out the virtual tour! MLS#9631237. Supreme Realty Group. All information deemed reliable but not guaranteed; buyers and buyer’s agent to verify all information, taxes, HOA, schools, measurements. MLS#1990972. HomeSmart Realty Group. Great location walking distance to schools. MLS#3743243. Redfin Corporation. Close To 4-70, Dia, I-70, I-225,Southlands. A Great Value! ! MLS#2397758. MB EXECUTIVE REALTY & INVESTMENTS.